Clocktower Players, resident theater company of the landmark Irvington Town Hall Theater, announces its 2018-19 Season line-up of diverse Tony Award®-winners, classic musical favorites, and a deeply moving play that’s as relevant as ever. Clocktower’s “Best of Westchester” Youth educational theater programs welcome all children, build confidence and enrich lives. 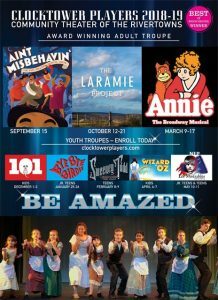 Youth Troupes begin Sept 13th and include: Pre-Troupe Acting Adventures—our cornerstone class introduces 4-6 year old’s to the world of theater through imagination and play; our beloved Kids Troupe (Grades 1-4) will delight in Disney’s 101 DALMATIANS Dec 1,2 and THE WIZARD OF OZ JR April 6,7; Jr Teen Troupers (Grades 5-8) will shine in BYE BYE BIRDIE Jan 25,26; Teen Troupers (Grades 9-12) will thrill in SWEENEY TODD school edition Feb 8,9; and, the Jr. Teen and Teen Troupe (Grades 5-12) will inspire as they close out the season with the legendary musical masterpiece, LES MISÉRABLES, School Edition on May 10,11. In a continued effort to share the gift of live theater with all youth, need-based scholarships are available through the generosity of our donors for tuition-based programs. Champions of diversity, giving voice to stories as rich and complex as the great tapestry of America itself, Clocktower Players Community Theater Adult Troupe has been honored to receive many accolades including Best of Westchester’s Best Local Theater Group, 2015 OnSTAGE Critic’s Awards, including Outstanding Musical Award, and selected by NY Theater Guide as one of the top five community theater companies in New York State. The New York Senate proclaimed June 9,2017 “Clocktower Players Day” and its creative accomplishments, commitment to diversity and dedication to the community have been recognized by Senator Andrea Stewart-Cousins, Assemblyman Thomas J. Abinanti and Greenburg Town supervisor Paul J. Feiner. Kicking off the 2018-19 season as only Clocktower can, patrons are urged to purchase tickets early for the September 15th production of AIN’T MISBEHAVIN’ – one of the most popular, well-crafted revues of all time. Winner of the 1978 Tony Award for Best Musical, this is a musical tribute to the black musicians of the 1920s and 1930s who were part of the Harlem Renaissance, an era of growing creativity, cultural awareness, and ethnic pride. The intoxicating music will delight and energize audiences and provide great insight into a vibrant time in American history and music. In autumn, from October 12- 21, Clocktower’s Award-Winning Adult Troupe is honored to present THE LARAMIE PROJECT, a deeply moving play about bigotry and tolerance, fear and courage, hate and hope. Twenty years ago, Matthew Shepard died on October 12, 1998 after being brutally attacked, tied to a fence and left to die in a field outside of Laramie, Wyoming. The life and death of Matthew Shepard changed the way we talk about, and deal with, hate in America. Although Matt’s life was short, his story continues to have a great impact on young and old alike. His legacy lives on in thousands of people who actively fight to erase hate with understanding, compassion, and acceptance. A percentage of the profits of this production will be donated to The Matthew Shepard Foundation. Spring-time brings the perfect family-friendly musical, ANNIE, to the community from March 9-17th. With its Tony award winning book and score, including the unforgettable Maybe, Easy Street, It’s A Hard-Knock Life and Tomorrow – ANNIE is one of the most beloved musicals in history. Bet your bottom dollar you’ll love it! Auditions for ANNIE, and all the latest CTP news be sure to LIKE Clocktower Players Inc. on FaceBook.